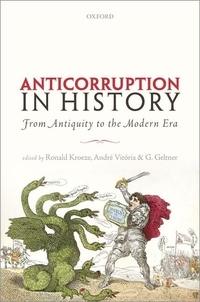 Anticorruption in History is a timely and urgent book: corruption is widely seen today as a major problem we face as a global society, undermining trust in government and financial institutions, economic efficiency, the principle of equality before the law and human wellbeing in general. Corruption, in short, is a major hurdle on the "path to Denmark" a feted blueprint for stable and successful statebuilding. The resonance of this view explains why efforts to promote anticorruption policies have proliferated in recent years. But while the subject of corruption and anticorruption has captured the attention of politicians, scholars, NGOs and the global media, scant attention has been paid to the link between corruption and the change of anticorruption policies over time and place, with the attendant diversity in how to define, identify and address corruption. Economists, political scientists and policy-makers in particular have been generally content with tracing the differences between low-corruption and high-corruption countries in the present and enshrining them in all manner of rankings and indices. The long-term trends & social, political, economic, cultural; potentially undergirding the position of various countries plays a very small role. Such a historical approach could help explain major moments of change in the past as well as reasons for the success and failure of specific anticorruption policies and their relation to a country's image (of itself or as construed from outside) as being more or less corrupt. It is precisely this scholarly lacuna that the present volume intends to begin to fill.